I couldn’t find my socks today. Perhaps like Hobo Bob from Wayside School, I should have looked in the freezer. I do actually know that the freezer is one place the socks definitely aren’t. My freezer is empty, but my house is full of boxes. The socks lurk in one of the many unpacked boxes. I should be looking for them right now, but books are on my brain. Maybe I couldn’t find my socks, but I did take time to meet my Kidlit Book Blogger friends yesterday to celebrate the Newbery announcements with breakfast and a trip to the awesome Cover to Cover! Some would question my priorities, but if you know me…. My husband and I both grew up in the small town we live in. When we met, we both lived in the village, and when we were first married we loved the many plusses of being able to walk to the library, to school, etc. Needing more space than our home had for children and dogs, we spent the last eleven years outside of town, hoping to move back into the village at some point. I might not know where those socks are, but I am thrilled to be back in walking distance of the library, school, and have the built in exercise of dogs that need multiple walks a day. I love our 1920’s home with the old woodwork and old house charm and quirks! Today my friend told me it reminds her of the original book Cheaper by the Dozen and for me it brings back memories of illustrations from the Betsy and Tacy books for me! Yet another thing to love about our move-a house that brings back happy childhood reading memories for myself and my friends! 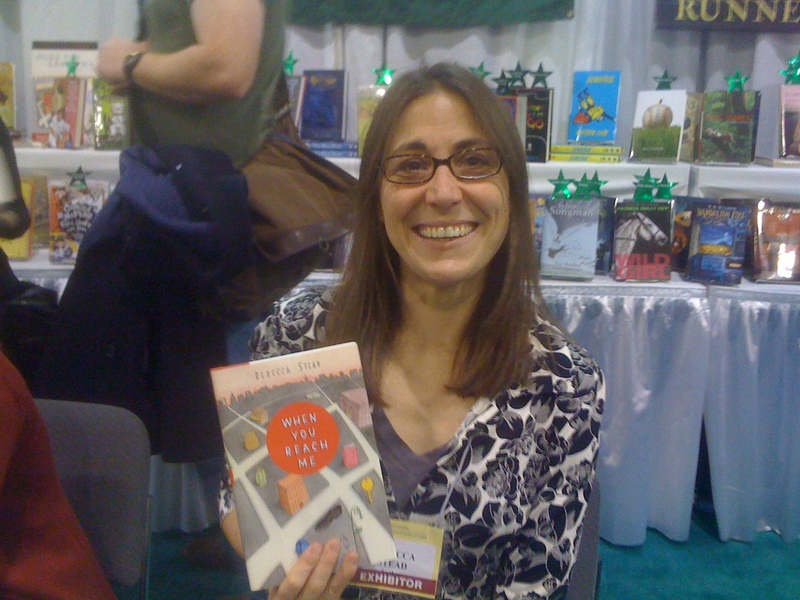 Back to 2010 Newbery awards! While I was disappointed to have not predicted (or read-yikes!) any of the Newbery winners, I was thrilled that Rebecca Stead’s When You Reach Me won! She was delightful at NCTE this fall and having a personalized, autographed copy of the book is pretty darn cool! It’s been in my TBR pile, but my daughter got to it first. She really enjoyed it and loved how the cover came together for her like pieces in a puzzle as she read. Great job to fellow bloggers A Year of Reading’s Mary Lee and Franki, Literate Lives’ Karen and Bill, and Cover to Cover’s Beth and Sally on reading and having the winner on their short list. Check out their blogs for the group photo. Also in my TBR pile are Newbery Honor The Evolution of Calpurnia Tate and The Mostly True Adventures of Homer Figg and Printz Honor Book Charles and Emma: The Darwin’s Leap of Faith. I picked up When The Mountain Meets the Moon. Printz winner Going Bovine was the 2010 Printz winner, so I’ll give myself credit for having read that one already. What an interesting, funny, quirky book. All winners can be found at ALA.
Big oops over at Random House for announcing the award winners on Twitter before ALA announced. Wonder if anyone lost their job over that faux-pas! Central Ohio KidLit Bloggers just can’t get enough of Cover to Cover or books! To celebrate the annoucements of the award winners, we met at our favorite book store and then had dinner at Northstar Cafe. It can’t get much better than that! Me (Bestbookihavenotread), Karen (half of Literate Lives ), Sally Oddi (bookstore owner extraordinaire! ), Katie (Creative Literacy), Authentic Learner authors, Franki Sibberson (half of A Year of Reading), author Amjed Qamar (Beneath My Mother’s Feet), and Mary Lee (other half of A Year of Reading). The Graveyard Book-Neil Gaiman (posted MouseCircus link last week, but just bought tonight)-Franki wins since she and Sally are the only two who have already read it!